Children can dress the dolls for a glamorous masked ball, an ice skating adventure, a trip to the ballet, a magical carriage ride and lots more festive fun in this Christmassy sticker book. With over 600 reusable stickers of beautiful dresses, cosy coats, beautifully-wrapped gifts, ice skates and tutus to get the dolls ready for the festive season. The reusable stickers can be lifted and repositioned, and the back cover folds out to make a “sticker park” where children can store stickers while they are working on a scene. 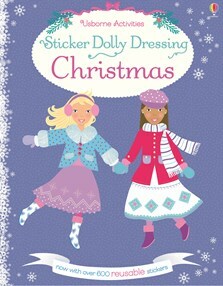 Little girls everywhere will love dressing the characters in this colourful festive sticker book. Great fun! This lovely book gave my daughter hours of fun with the beautiful sparkly stickers. Some of the stickers peeled off quite quickly but we glued them down. A good purchase!